1) Puppy Starter Pack: Covers every puppy chewing stage! 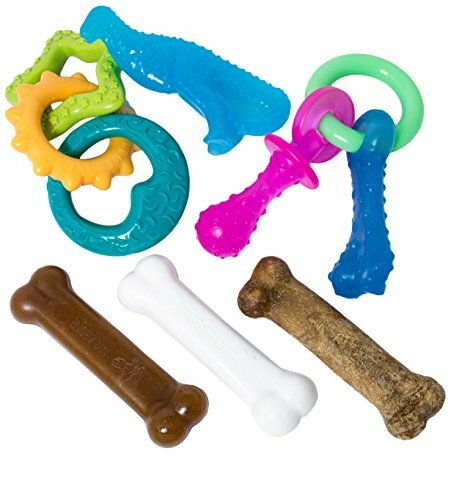 It contains a Puppy Moderate Chew Flexi Chew Toy made of softer material as your puppy starts losing his baby teeth. Teething can be painful and uncomfortable, but this puppy dental toy is the best way to ease his discomfort. The starter pack also contains a Healthy Edibles puppy treat bone that contains DHA and omega-3, which support brain and eye development—with no added sugar, salt, artificial colors, flavors, or preservatives! Once your puppy’s permanent teeth come in, toss him the long-lasting DuraChew puppy chew toy, which will entertain him and teach him positive chewing habits. 3) Dental Dino Puppy Chew: This puppy teething toy satisfies your pup’s prehistoric urge to chew with irresistible flavor throughout and a fun T-Rex shape! Plus, its gentle, puppy-friendly nubs promote clean teeth and help control plaque and tartar buildup.